It seems like every time you turn on the news, there’s another story the rising cost of food. Every time you pick up the newspaper, you notice that there are fewer good coupons, and less sales than there used to be. I’ve said before that you have to learn how to make saving a habit, and that’s especially true when it comes to your food bill. 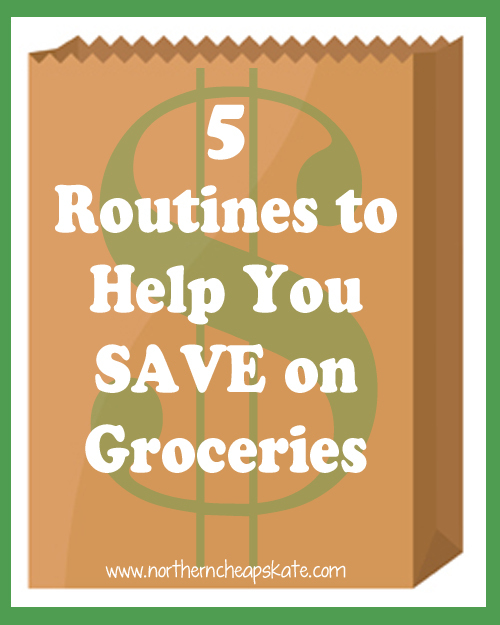 Establishing some smart routines to help you save on groceries will allow you to continue to eat well on a tight budget. The following list contains some of the routines I’ve developed that help me save on groceries. The key to using these routines to save money is to make them as instinctive as brushing your teeth. You have to really work to make them a regular part of your life. You can’t just do them once and be done. If you want to see continual savings, you’ll have to train yourself to be consistent in these practices. Plan a menu based on sales and what’s in season. Menu planning is probably one of the most important routines you can establish if you are looking to save money. When you have a plan, you are less likely to resort to overpriced convenience foods or waste money on restaurant fare. You’re less likely to toss food that expired in your fridge. Buying what’s in season is a great way to save money, and when you match coupons to sales, you can save even more. We Americans waste a ridiculous amount of food every week. And wasted food means wasted money. Are you always tossing lettuce that’s rotted in your fridge? Figure out a way to store it better, start eating it, or don’t bother buying it. Do a regular pantry cleaning so that you can do an accurate inventory of what’s in your pantry, cupboards, and freezers, so that you can plan menus around using up those items. Learn to re-purpose leftovers so that they don’t go to waste. You can buy food in bulk to save money, but it will be a big waste if you don’t store it properly and make a plan for it. Go meatless at least one day a week. Eating one meatless meal each week means you could save $20 to $35 a month on your grocery bill. Beans, quinoa, and eggs can all be great, filling alternatives to meat. If you simply can’t give up the meat, you can eat less of it and still save. You can use beans and lentils to stretch ground beef for sloppy joes, tacos, or meatloaf. Swap mushrooms for meat in your spaghetti sauce for a healthier, less expensive meal. Drink more water and less soda, juice, and milk. One of the biggest grocery budget busters around are beverages. Pop, juice, and milk can really add on calories, too. Give up soda if you can, and limit juice and milk to one glass a day. Avoid artificial sweeteners for your water, and instead add sliced lemon, strawberries, or cucumbers to give your ice cold water a flavor boost. Make more items from scratch. Convenience foods can really jack up your grocery bill. Learn to make your own homemade seasoning mixes. Bake your own bread. Make your own pizza dough. Instead of buying pricey breakfast sandwiches, learn to make your own. Grow your own food and dry your own herbs. You will find that not only do you save money, the act of making your own items will give you a sense of pride because they simply taste better and are better for you. When you make a concerted effort to approach life with a waste not, want not attitude, you will start to see a difference in how much money you can save. Stick to these routines, but give yourself room to be creative in how you approach them. As you gain a better understanding of what you’re capable of saving, you’ll be able to add new money-saving routines in all areas of your life. What routines have you established that help you save money?